The “Open Parliament” on-line platform - an independent digital tool which collects credible data, structured in specific profiles of the deputies, tracking their relations with the public and private sector and their parliamentary activity. The blog is an independent on-line media providing objective information on the work of the authorities, investigating institutional violations and defending the public interest. “My Vote” platform is an interactive tool explaining to the voters their rights and obligations, the election procedures – deadlines, responsible institutions, filing of complaints and reports. “Zakrila” (which means “Shelter” in English) - an online tool presenting systematic institutional information about the refugees in Bulgaria. “For Fair Elections” crowdsourcing tool - a map of the violations in the election process in Bulgaria, based on the Ushahidi platform that was launched for the Presidential and municipal elections in 2011. #OurVoiceCounts is a free-to-use platform that integrates more than 60 institutional datasets allowing its users to conduct new types of research. On 19th of September, 2016 IPED organized a press-conference on the topic "Elections and referendums - the use of citizens’ personal data - possible risks and prevention". 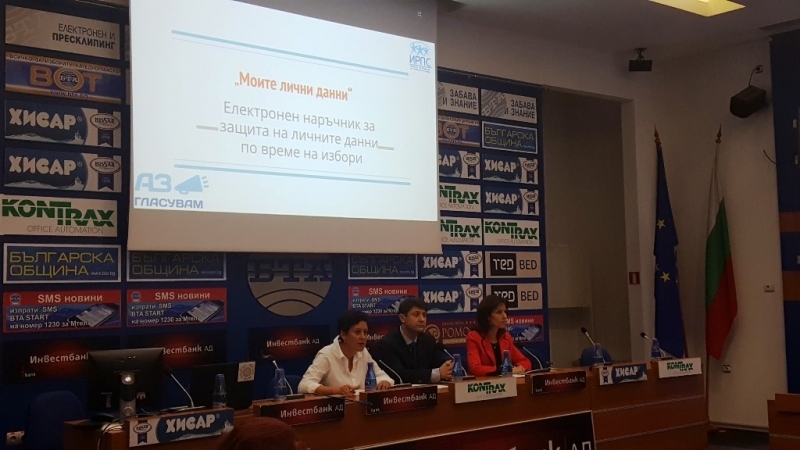 The participants in the press-conference were: the Chairman of the Commission for Personal Data Protection - Mr. Ventsislav Karadjov, IPED’s Chair of the Board - Mrs. Antoaneta Tzoneva, the Speaker of the Central Election Commission - Mrs. Kameliya Neikova. IPED presented the online tool “My Personal Data”, developed in cooperation with the Commission for Personal Data Protection. Electronic check on the official web-site of the Central Electoral Commission; inspections by the General Directorate “Civil Registration and Administrative Services” of the collected signatures in support of political parties/coalitions/initiative committees.